Click above to view current issue in PDF format. To download the PDF, right-click on the link and choose "Save Link as..." or "Save Target as...". Requires free Acrobat Reader or Adobe Acrobat. If you are having difficulty viewing with the latest version of Firefox and its native PDF reader, follow the instructions for "changing back to your other PDF reader" at this page. The School of Nursing's Veterans Access Program puts veterans with medical training on an accelerated path to a UNCG bachelor's degree in nursing. Nancy Adams '60, '77 MS, with the support of UNCG Dean Eberhart, became the first genetic counselor in the state of North Carolina. Hear her tell her story. Weatherspoon Director Nancy Doll gives her perspective on the painting, its story and why it's always gotten a reaction from viewers. A sustainable replacement for the use of baitfish? Anthony Dellinger '14 PhD tells how it's done. It's the passing of the torch from one alumna to another. Angela Polk-Jones '89, '07 MSA congratulates the new women's basketball all-time scorer: Lucy Mason '15. The principal of the Middle College at UNCG, Angela Polk-Jones was the all-time leading scorer in UNCG women's basketball. That is, until Lucy Mason took that title in December. Lucy also has been researching notable African-American figures at UNCG. See her posting on Angela. Jordy Kuiper doesn't get home to the Netherlands often. He calls his teammates his family. But his mother surprised him in January, the first time she has ever taken him by surprise like that. What a great moment. Grogan Residence Hall's baby grand piano arrived on campus in 1965 and has been a Grogan fixture the last 10 years. It's called the soundtrack of Grogan. Students play it almost constantly. UNCG offers the opportunity for an excellent education to students throughout the world. International students enrich the diversity and learning opportunities for the entire student body. Here are three stories, told by the students themselves in short video clips. Soon, they will be among the UNCG alumni making an impact in our world. Mei-Lan Chen shares her story about her life in Taiwan and the United States. Chen is pursuing her doctorate in UNCG's Nursing PhD program. She explains how the relationships she's fostered at UNCG are lifelong. See the video. Rudolph Bedeley shares his story of leaving Ghana, where he gained his undergraduate degree in engineering, to pursue additional education in the U.S. He is pursuing a PhD in information systems at UNCG. Liwen Huang shares her story of leaving her hometown of Tianjin, China, to discover how big the world is and more fully learn English. Her journey led her to the United States and UNCG, where she is pursuing a bachelor's of science in entrepreneurship. Find these features and departments in the PDF of the magazine above. 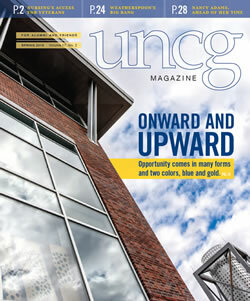 UNCG provides the chance to strive for dreams and prepare to make your mark on the world. Some alumni and students share their tales of transformation. Gregory Ivy arrived to create an art department, and ultimately de Kooning's Woman was purchased as part of the Weatherspoon collection.